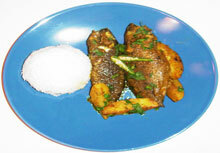 Curry with Koie fish is a delicious dish in the Indian sub continent. Koie is known as climbing perch. Beside the taste of the fish, scientific studies have confirmed the beneficial heart healthy effect of fish oil (omega 3 fatty acid) in reducing bad cholesterol. In the age of obesity and over weight problem, eating fish instead of red meat should be considered as a healthy choice. In the second step the potatoes will be fried with spices and then cooked. Finally, the fish will be added to the gravy and cooked some more to bring it to semi dried state. 3. In a moderately hot pan, add about 3 tablespoons of mustard oi. l4. When the oil is hot to feel add the fish into the oil and fry each side for about 3-4 minutes. You may like to cover the pan if it splatters. Both sides should look well fried. 7. 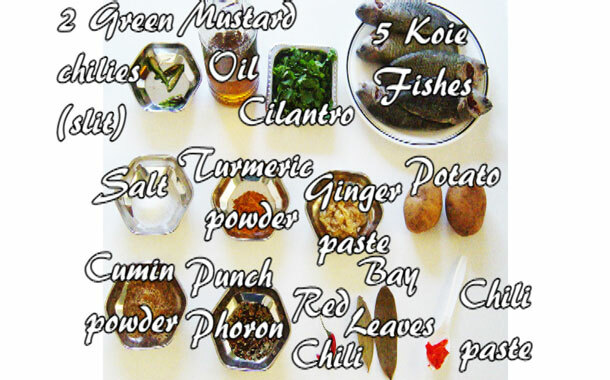 Add the Punch Phoron. 8. Add one red chili. 9. Then add the potato slices. 10. Stir them well till the potatoes acquire a brown hue on all sides. 11. Add the ginger paste. 13. Add the cumin powder. 15. Add the turmeric powder. 16. Stir the potato well with all the spices. 17. Add one and a half cup of water. 18. Add the green chili paste. 21. Cover the pan and bring it to a boil. 22. In about 4-5 minutes or when the potato has become soft, add the fried fish into the gravy. 24. If the gravy looks dry, then add a half cup of water. 25. Cover the pan and cook. 26. In about 2-3 minutes, open the lid and turn the fishes over. 27. As the gravy thickens and the curry looks moist, remove it from heat. 28. Add the chopped cilantro. 29. Add the slit green chilies. This completes the preparation. It will serve 2-3 people and takes about 30 minutes. Serve the Koi macher jhol (fish curry) hot with steamed white rice.